Kinetic-theory-based models of rapid, polydisperse, solids flows are essential for the prediction of a wide range of practical flows found in both nature and industry. In this work, existing models for granular flows are critically compared by considering the techniques used for their derivation and the expected implications of those techniques. The driving forces for species segregation, as predicted by kinetic theory models, are then reviewed. Although the rigor associated with the development of such models has improved considerably in the recent past, a systematic assessment of model validity and computational efficiency is still needed. 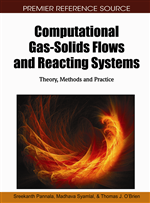 Finally, a rigorous extension of such models to gas-solid flows is discussed. In nature and industry alike, flows involving solid particles are time and again polydisperse – i.e., the particles differ in size and/or material density. This polydispersity may (i) be a property of the starting material itself, (ii) arise from the need for two different materials in a processing step, or, (iii) be specified in order to improve system performance. Industrial and natural examples of (i) include coal feedstock to combustors and terrestrial and lunar soils, respectively. The production of titania is an example of (ii), where one step of the synthesis involves both titianium ore and coke, which vary in both particle size and material density from one another. Finally, as an example of (iii), the addition of fines to a relatively monodisperse material has been shown to decrease attrition in high-speed conveying lines (Knowlton, Carson, Klinzing, & Yang, 1994), increase conversion in high-velocity, fluidized-bed reactors (Pell & Jordan, 1988) and improve heat transfer efficiency in a circulating fluidized bed (CFB) combustor (Lee, 1997). Not surprisingly, the flow behavior of a polydisperse material is different from that of its monodisperse counterpart. For example, recall from the previous chapter that a continuum description of rapidly-flowing, monodisperse solids flows is possible via a kinetic-theory analogy, which requires the specification of constitutive quantities such as the solid-phase stress. Similar descriptions are possible for polydisperse flows, though the solid-phase stress, as well as the other constitutive quantities, now also depend on the characteristics of the polydisperse distribution – e.g., the diameter ratio of particles in a binary size distribution, the density ratio of two unlike materials, the standard deviation of a continuous size distribution, etc. Beyond the aforementioned expected changes to the constitutive quantities caused by polydispersity, such flows also display a counter-intuitive phenomenon which has no monodisperse counterpart: species segregation or de-mixing. For example, agitation of polydisperse solids via vibration, free-fall, or flow down an incline leads to segregation among unlike particles. A famous example of this behavior is the well-known Brazil nut problem, in which a can of mixed nuts, after shaking up and down, is opened only to find an over-representation of the Brazil (large) nuts at the top of the can (Rosato, Prinze, Standburg, & Swendsen, 1987). Although such segregation may be beneficial to operations targeting separation, as found in the mining industry, it may prove detrimental if a well-mixed system is desired, as is common in the pharmaceutical industry. More specifically, consider a tablet which is made from two powder substances – the medication and the binder which holds the medication together. If these two substances are not-well mixed prior to tablet formation, a patient may be over- or under-medicated. A related example with less serious ramifications involves raisin bran cereals, in which the raisins are poured on top of the box prior to loading on distribution trucks since the vibration during transport mixes the raisins throughout the box.